There are 32 teams in the NFL across 21 states. Super Bowl XLIX, New England Patriots versus Seattle Seahawks, was the most-watched Super Bowl and most-watched television program of all time with a staggering 114.4 million American viewers. This past season, 103.4 million American viewers tuned in for Super Bowl LI, Patriots versus Atlanta Falcons. You could say professional football is a pretty big deal. The various football teams have a lot of work to do on the field, and their communication teams have a lot to do off of it. Each team has to connect with thousands of fans, and one great tool to do this is social media. Any given team will be using social to post game results, questions to fans, information on players, news about the team, the game schedule, merchandise and more. 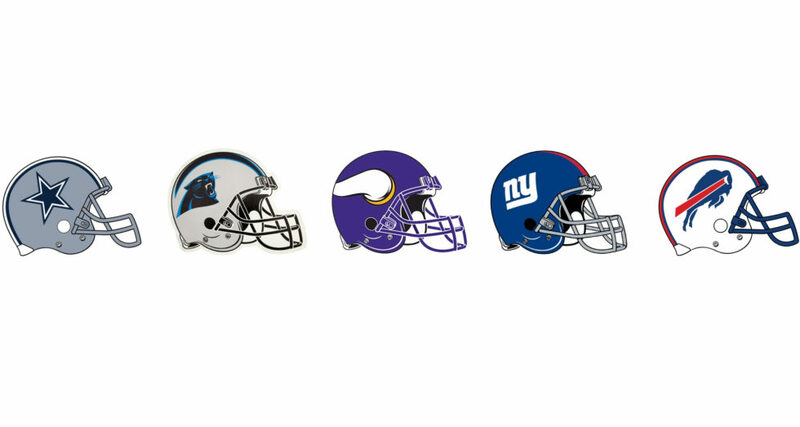 That being said, we’ve ranked the top five NFL teams who we think have done a stellar job with their social media. The Cowboys have 3.75 million followers on Twitter, 2.6 million followers on Instagram and 8.6 million likes on Facebook. 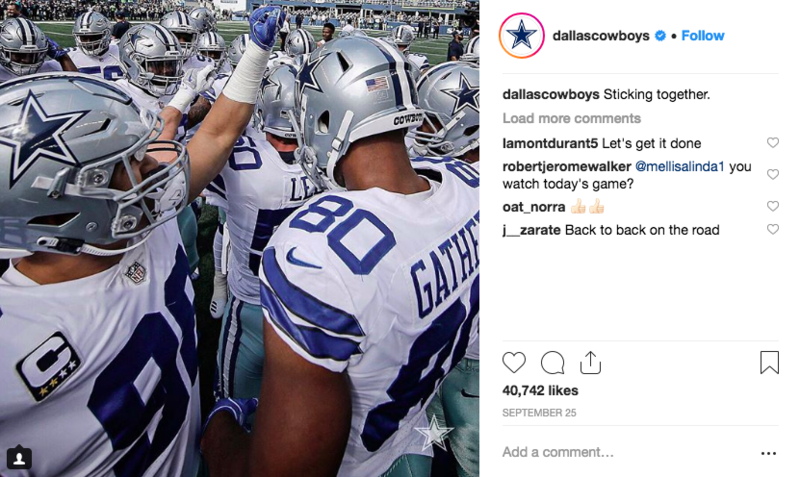 We love that, like most teams, the Cowboys share player interviews and highlights, but the team stands out in the way it uses social media to focus on the team as a whole and the friendship between players. We also love the shoutouts the Cowboys give the Dallas Cowboys Cheerleaders, who have 393,000 Instagram followers of their own. The Cowboys do a great job of utilizing Instagram stories, including highlights of wallpapers, captains, events and the season schedule. Most importantly, this team makes its social media shine by never missing a birthday shoutout to the players and well wishes to fans on holidays. The Carolina Panthers have 3.01 million followers on Twitter, 1.5 million followers on Instagram and 2.3 million likes on Facebook. The Panthers might have the most clever and humorous social media in the NFL. Expect to see a gif blowing off a big loss or the Panthers hitting another team with lighthearted jabs on Twitter. The Panthers are also in tune with younger fans and pop culture, recently turning Ariana Grande’s hit song “Thank u, next” into a hilarious meme and sharing the Panthers players you can play in the popular video game, Fortnite. The Panthers can also be serious. We appreciated the team’s post in solidarity with Pittsburgh after the recent shooting at the Tree of Life synagogue. 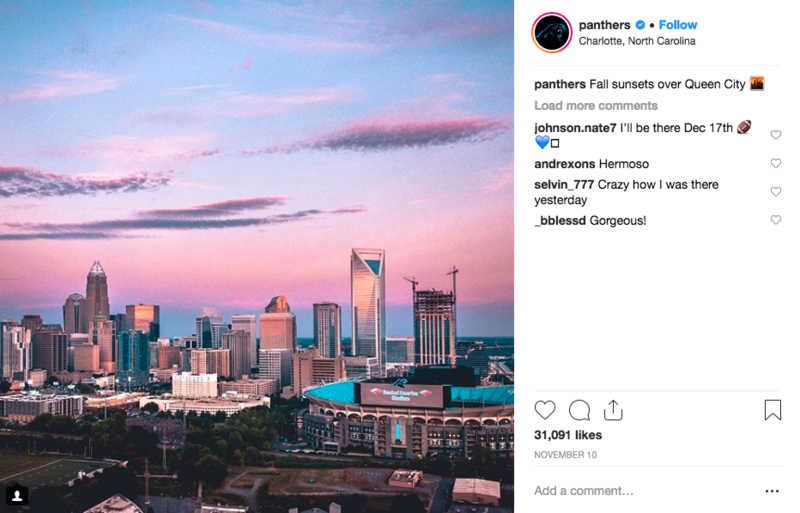 In addition to staying on top of current events, the Panthers love showing off their players off the field, their fans and their city, Charlotte, North Carolina. We’ve also got to hand it to Sir Purr, the official mascot of the Carolina Panthers, who boasts 17,900 followers on Instagram. The Minnesota Vikings have 1.26 million followers on Twitter, 769,000 followers on Instagram and 2.1 million likes on Facebook. The Vikings have a Facebook show, The Rundown, but with a pretty small following of just 1,700 followers. So! Much! Purple! 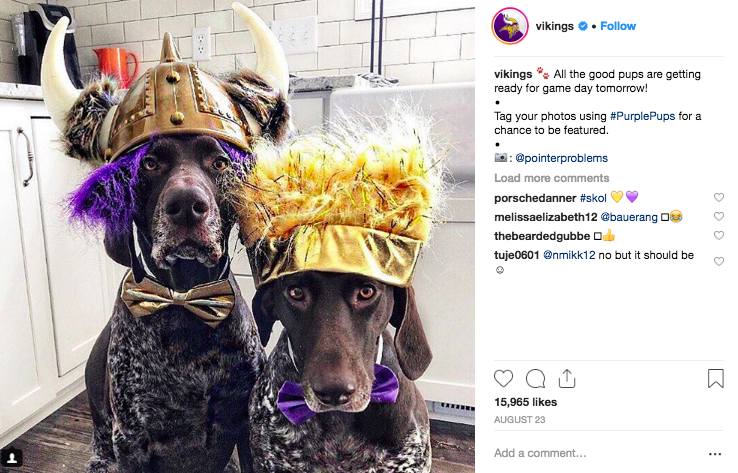 The team colors of purple and gold jump out at you on the Vikings’ social media but especially on Instagram where uniforms, crowds of fans and tinted cartoons make a wave of purple. 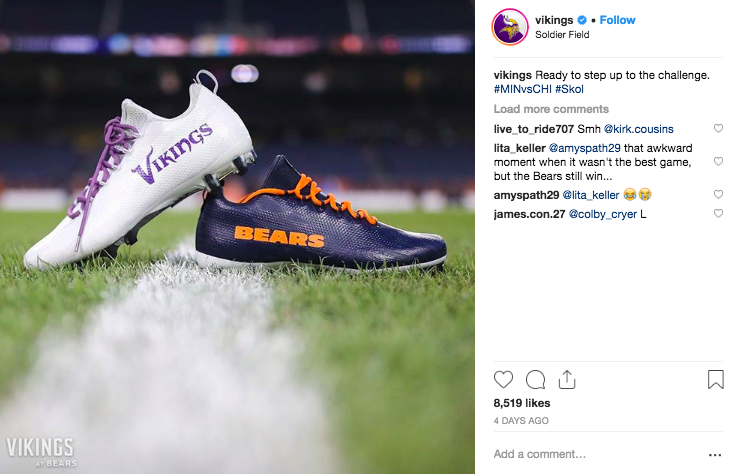 This team gets fans pumped for upcoming games by putting the Vikings’ cleats up against their opposition’s footwear. We also love the way the Vikings get their fans involved with #purplepups. The Giants have 1.8 million followers on Twitter, 1.7 million followers on Instagram and almost 4 million likes on Facebook. The Giants also have a show on Facebook, called Giants Life, that has 4,000 followers. The Giants do so much community service and giving that there’s an account dedicated just to community relations! We love that the main Giants’ Twitter does a great job of retweeting highlights and sharing those moments with a larger Giants’ audience. Like the Vikings, the Giants get fans involved with #NYGiantsPup, which has been used on almost 900 posts this season. 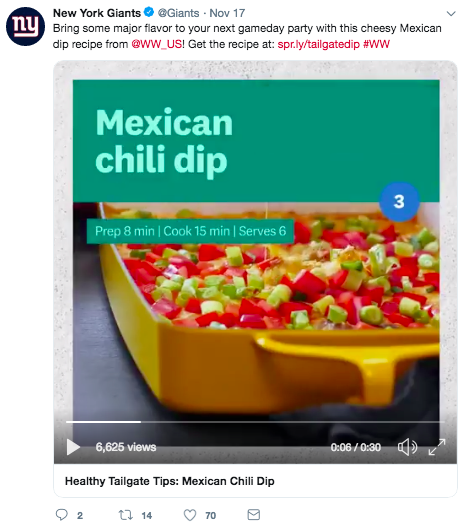 Where the Giants stand out are their fun and flavorful posts sharing healthy tailgate recipes, which are done in partnership with Weight Watchers. The Buffalo Bills have 965,000 followers on Twitter, 472,000 followers on Instagram and more than 890,000 likes on Facebook. The Bills also have a Facebook show with 17,000 followers. The Buffalo Bills prove that the number of followers you have doesn’t always equate to the originality of your posts. 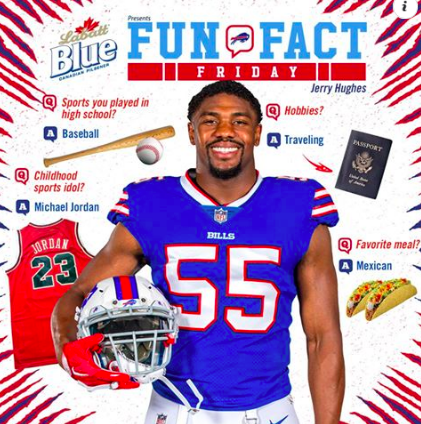 We love the Fun Fact Friday posts the Bills have been doing to highlight players and make them relatable to fans. We also love how the personal lives of the players are shared on the team page, including interviews with the wives and kids of players. Loyal football fans get excited about the uniform their team wears. This team shows its social media finesse by sharing what combination of pants, jerseys, gloves and socks the Bills will be wearing at their next away game. Overall, the Bills are great about connecting with fans and are giving them a look behind the scenes. Interested in other ways social media can shine? Check out our blog about getting the most out of your hashtags. Written by Kaitlyn Karcher, a senior at the University of North Carolina at Chapel Hill.